Guess what?! Today I am sharing a new friends recipe with you. 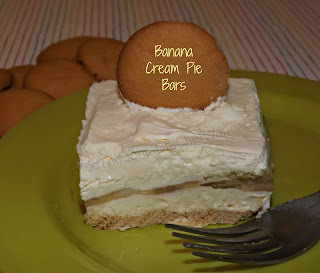 I was perusing Facebook on Sunday and like a beacon of light came this beautiful photo of "Banana Cream Pie Bars". I heard angels yodel and knew my husband was going to go "bananas" over it. Funny, eh?! Jen from Peanut Butter and Peppers was kind enough to say "YES" when I asked her if I could blog these and share with you. When you visit her website you will see she has been on a weight loss journey in the past, so she made these with sugar free pudding, fat free cool whip and different cookies. I used what I had on hand, but I don't see any reason I won't make it that way next time. We LOVED these. My recipe you will see is a bit different from hers, but not much. You can find the original recipe here. Give her a visit on Facebook! In a food processor or whatever you use to make things into dust, use it. Add in your nilla wafers and melted butter. When it is fine crumbs place in the bottom of an 8x8 square baking dish. Press firmly, and evenly on the bottom of the dish. In a medium bowl, using a hand mixer beat your cream cheese until it is smooth and creamy. Add in your banana pudding and cool whip. Beat until all ingredients are a smooth, delicious mixture you want to stick your face into! Add half of your pudding mixture into the baking dish and spread evenly over the crust. Now add your sliced bananas and then the rest of the pudding mixture. You can crumble some wafers on top for garnish, use maraschino cherries, or, come up with your own genius garnish! Refrigerate 3 hours before serving. Enjoy and thank you to Jen for posting this delicious recipe! We LOVED it and it is so easy, make it healthier like Jen did or make it this way, you can't go wrong no matter what you do! Ahhh, thank you so much! You are to sweet your Banana Cream Pie looks to die for!!! omg this looks yummy; will try soon; Thanks!